“Science fiction films are not about science,” wrote Susan Sontag. “They are about disaster, which is one of the oldest subjects of art.” Disasters are not just art’s subject, however, but also one the main destroyers of art itself. T he terrible blaze that consumed some 90% of the collection of Brazil’s National Museum in September destroyed dinosaurs, fossils, ancient human remains and unique recordings of vanished indigenous languages. One of the few survivors was extra-terrestrial, the 5260kg Bendegó Meteorite. The cause of the Rio fire is yet to be confirmed, but an electrical fault is suspected. 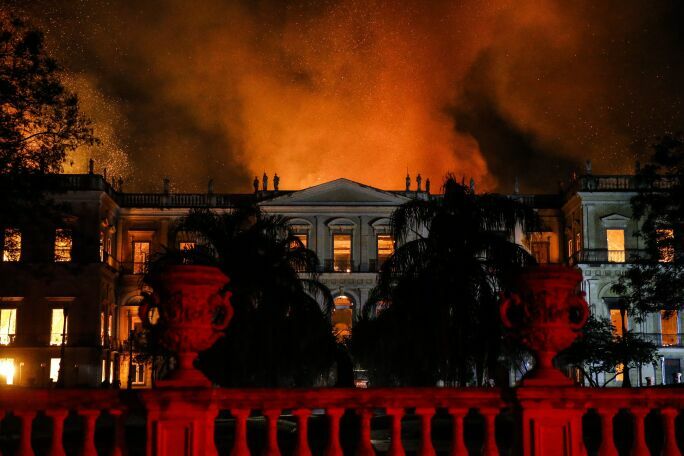 Brazil's National Museum during the fire, 2 September 2018. © Tânia Rego/Agência Brasil. There’s a perception, however, that you just cannot plan for many potential disasters – earthquakes, catastrophic storms and other “acts of God” or sudden and unexpected terrorism. This is not the case, however, as decades of improved emergency planning in museums and galleries demonstrates. 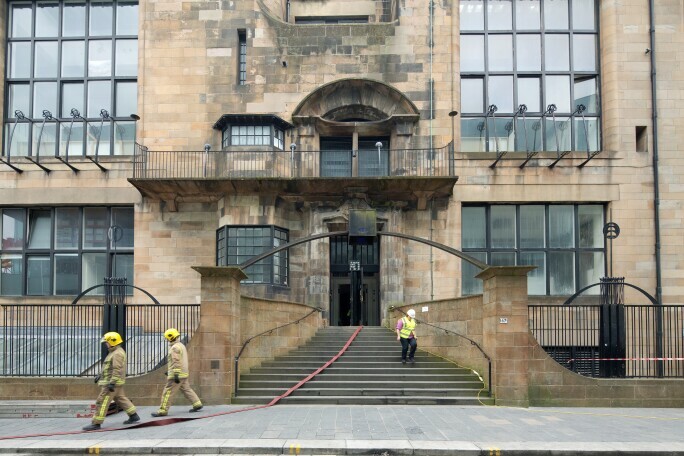 Emergency services at work during the fire at the Mackintosh Building, part of the Glasgow School of Art, 2014. © McAteer Photograph. When two planes brought down the World Trade Center on 9/11, there were some 120 museums, libraries, exhibition spaces and archives in Lower Manhattan that were affected by, if not the immediate blasts, then the noxious shower of dust that followed. The outcomes for the different institutions were sobering: Citigroup, for one, lost more than 1,000 items of a substantial private art collection on the World Trade Center site and because the catalogue was incomplete following a merger, there will never be a full understanding of what has gone forever. Part of the restoration process of the Mackintosh Building, 2016. © McAteer Photograph. The New York-based International Foundation for Art Research (IFAR) organised a conference to learn lessons from 9/11. A conference paper by Lawrence Reger of the US-wide Heritage Emergency National Task Force found that more than half of respondents to a survey, sent out to museums predominantly in Lower Manhattan, had no written emergency plan in place and many didn’t see how they could have planned for a 9/11 type event. This may be true for those institutions on the World Trade Center site itself, but other collections just blocks away escaped serious smoke damage due to emergency planning measures: 40% indicated they were able to put at least part of their plans into effect; 46% said doors, windows, and other openings were closed or sealed; and a third managed to turn off their ventilation and other services. It could have been even worse; only one in 10 had the equipment in place necessary for salvaging collections and just over half kept no copies of their catalogues off site. IFAR’s executive director Sharon Flescher says institutions “cannot ignore the basics – security alarms, fire suppression and off-site data storage”. It’s hard to know how far back the history of cultural disaster preparedness goes beyond a bucket of sand or water in a museum corridor. Early known heritage preservation attempts include those designed to limit the depredations of the French Revolution. During the Second World War, meanwhile, Polish conservators spirited away blueprints and objects ahead of Nazi attempts to erase Polish culture. 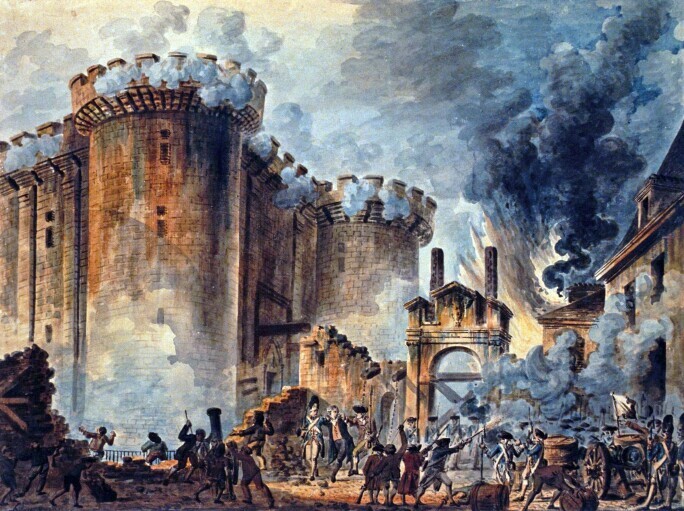 Jean-Pierre Houël, La Prise de la Bastille, 1789. Today, after decades of major cultural disasters such as the 1966 Florence and 1997 Oder Floods, the culture-targeting wars in the former Yugoslavia, the L'Aquila, Kobe, and Christchurch earthquakes and Hurricane Katrina, a whole raft of international measures has been put in place to ameliorate the effect of disasters on museums and galleries – to build cultural resilience. The slow burn of climate change and a commensurate increase in severe events such as wildfires and landslides has also focused minds – at least in some corners of the world. Among the key recent international developments are the UN Sendai Framework for Disaster Risk Reduction and Heritage and Resilience: Issues and Opportunities for Reducing Disaster Risks, a paper published in 2013 by ICORP, the Risk Preparedness Committee of the International Committee on Monuments and Sites, which advises UNESCO on such matters. Other bodies engaged in the global task include the International Council of Museums’ Disaster Risk Management Committee, Blue Shield (a heritage equivalent of the Red Cross) and UNESCO’s International Centre for the Study of the Preservation and Restoration of Cultural Property (ICCROM), based in Rome. 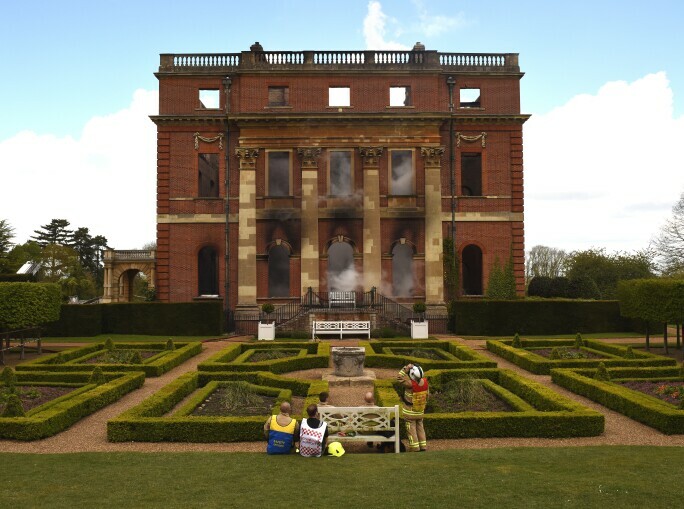 The day after the devastating fire at Clandon Park, Surrey, 2015. © National Trust Images/John Millar. ICORP committee member Fiona Macalister is a leading consultant preventive conservator in the UK and internationally. She notes that the UK and northern Europe have been especially active in resilience work for the cultural sector. In the UK, for example, museums, galleries and archives only enjoy official accreditation if they have a disaster plan in place and can demonstrate that they are working with a local fire and rescue service.Firefighters put themselves at risk for art, for example spending several hours rescuing over 400 collection items – including significant artworks – from National Trust mansion Clandon Park during a 2015 fire. Some fire-fighting forces now have dedicated heritage officers. There are shortcomings, however. Macalister points out that risk maps prepared under the European Flood Directive don’t identify cultural heritage sites. And often, when a museum or gallery’s emergency officer leaves their post, the impetus can be lost. 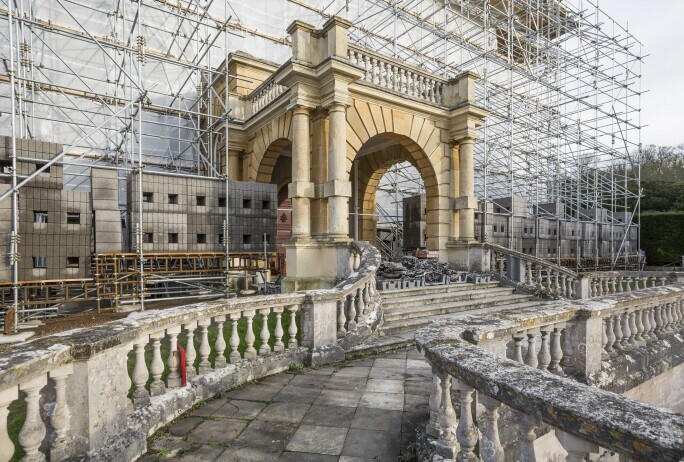 Scaffold sheeting protecting Clandon House from further damage after the fire at Clandon Park, 2016. © National Trust Images/James Dobson. The need to update and repair buildings also poses certain risks. “One of the key issues we seem unable to really address successfully is the prevention of fires during building works,” Macalister adds. The Health & Safety Executive guidance on this in the UK is really robust, but so often seems to fail in practice. 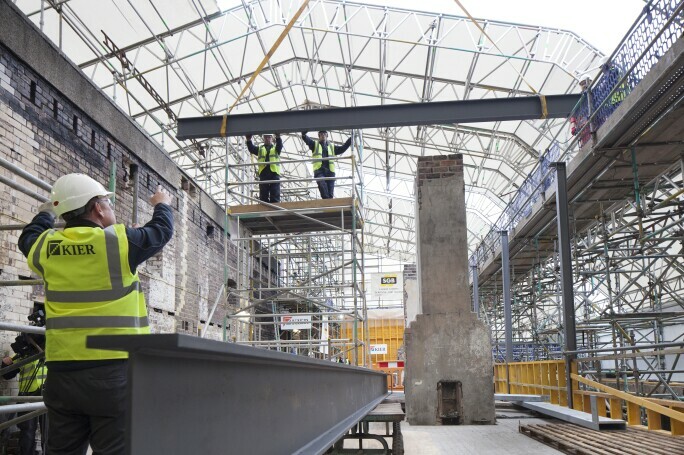 An example might be the Glasgow School of Art fires that have all but destroyed one of the city’s most important buildings not once but twice in recent years – the second time while under restoration. Catherine Forbes, a Sydney-based heritage consultant engaged in Pacific risk reduction and, like Fiona Macalister, an ICORP member, relates the tale of an historic school in the city that was subject to an arson attack while under refurbishment. Heritage experts, she says, were in dialogue with fire officers even as the building was burning. “Because we had a good knowledge of the building's structure and what was inside it, the fire chief was willing to discuss options with us. We were invited to enter the building with the firemen to assess the stability of the structure and to identify building fabric that could be sacrificed to enable the firemen to do their job, while minimising damage to more significant building fabric.” Among the most important lessons, Forbes adds, is having prior discussions with the builder and project manager about what to do if a fire were to break out. 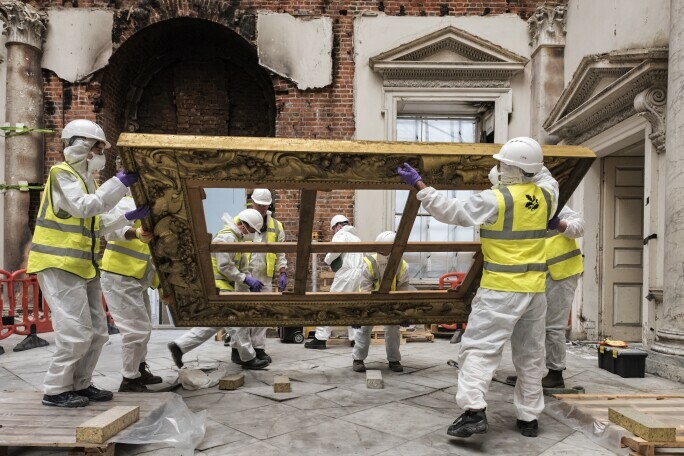 Conservationists working on the Clandon Park restoration project, Clandon Park, Surrey, 2016. © National Trust Images/Andreas von Einsiede. In large museums preparations can become elaborate: last year, under its Cultural Rescue Initiative, the vast Smithsonian Institution in the US, set up a faux museum – the “Smithsonia” – in one of its buildings complete with fake exhibits and role-playing curators in an effort to test its plans in the face of war or natural disaster. Participants had an hour to evacuate dozens of fragile “treasures” in the face of interference from officials, inept management and even a rogue reporter. 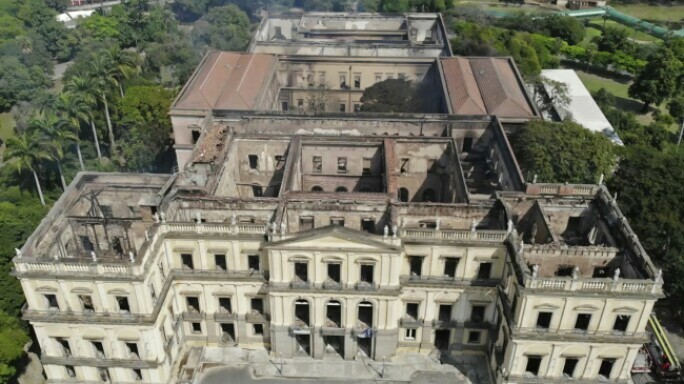 An aerial view of Brazil's National Museum after the fire, 4 September 2018. © AP/Mario Lobao. A few days after the fire, the country’s far-right presidential candidate Jair Bolsonaro (since elected) shrugged off concerns: “It caught fire already. What do you want me to do?” The answer to that is “plenty”.